Verity Edgecombe Photographer is an Adelaide wedding photographer who take timeless images with a modern vibe. Before a wedding day most couples get their photographers to come to the place where they are getting ready so they can have some casual, prep photos. This can be as short or as long as you would like. Your photographer can give you a rough timeline of what normally works for them. At this time of the day it's great to get photos of the bridal bouquets, the bridal gown hanging, the suits hanging, the small details like earrings and perfume and cuff links, socks and wedding invitations. I ask my couples to print their wedding vows onto nice paper and include a photo of that in their portfolio. Often this is chosen to be included in their wedding album and is a reminder of their promises to each other on the day they said "I do". It's great to be able to photograph both the engagement ring and the two wedding bands before the wedding too. Once the bridal party is all ready it's nice to get some photos of them just hanging out together. You might choose to have photos with your family at this time too. 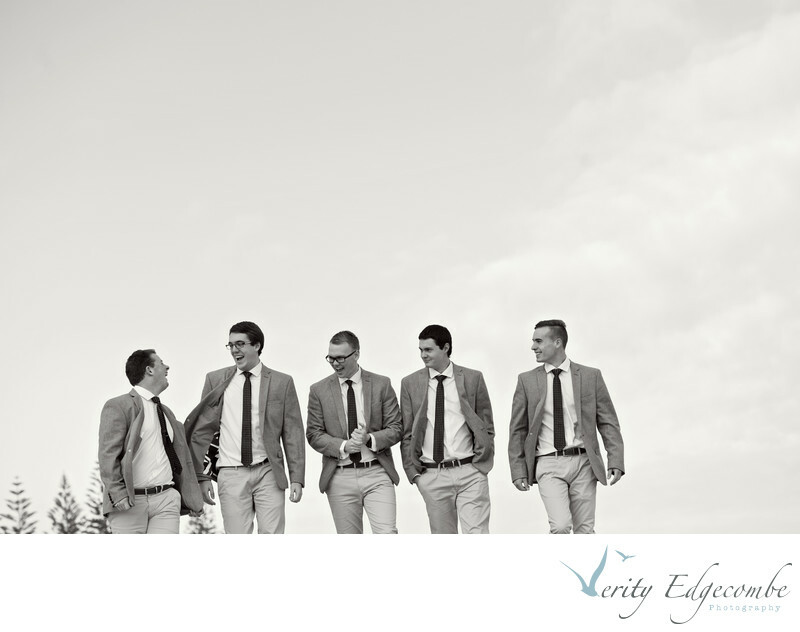 I love this photo of the groomsmen because I like the connection with each other, the angle the boys are against the lightly clouded sky and I'm quite a fan of groomsmen's photos in black and white! After photos at the grooms home with his family and at the beach with his groomsmen, they all headed to Ayers House for an intimate wedding ceremony and reception. You can see more photos of this Ayers House and Adelaide Botanic Garden wedding here. Contact Verity for wedding photography packages. Location: Semaphore Beach, Main Road, Semaphore.